Marjorie Owens in Norma at the London Coliseum. Photo: Alastair Muir. There are plenty of similarities between the handbags you see laid out on promenades at European beach resorts, and those you see behind glass and glitter at Harvey Nick’s, just as there’s a thin line between the overblown grandeur of opera and the grand over-blow of pantomime. 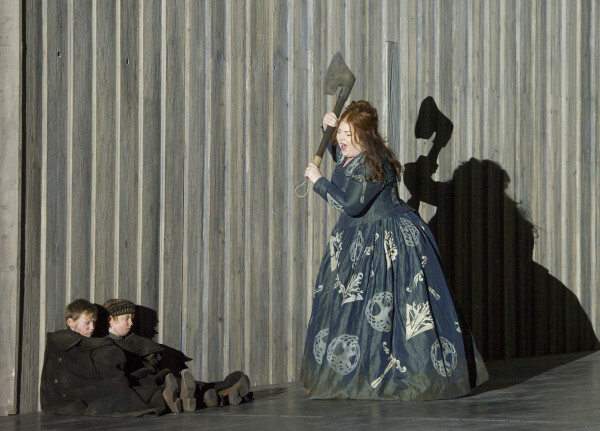 In the ENO’s take on Norma, this parallel between theatre’s most elitist and everyman entrances is all too apparent as pyrotechnics, axes and a rather unwieldy fallen tree combine to deliver a bel canto with as much emotional subtlety as your average Jack and the Beanstalk. That said, under Christopher Alden’s direction, the interactions between betrayed Norma and “other woman” Adalgisa, so sapphic with all their skirt pawing and neat duets, are engaging to the point that it’s easy to forget there’s a man involved. Traditionally, this opera hones in on the moral dilemma of the eponymous druid high-priestess, as she negotiates her personal love for a Roman against her tribal obligation to resist the occupier. Here, the ENO, on Charles Edwards’ spectacularly rustic set, unravels something that is both a women’s opera and a druids’ opera – and there’s no coincidence in this duo of moral triumphs of oppressed over oppressor. Making her ENO debut, Marjorie Owens carves a strong fit for a title role that is notoriously hard to cast and, in a production that lies firmly on the side of the druids, is persuasive in her application of cures and curses. Wearing an imposing blue dress, designed by Sue Willmington, Owens brings colour and a true vibrancy to an otherwise muted and earthy stage. While betrayed by a man who clearly has a thing for priestesses, Owens’ Alpha Woman refuses to be defined by this rejection. The two women take on mirrored gestures: Adalgisa writhing on the floor in spiritual agony before Norma, marginally more dignified, lies her coat on the ground to do the same. “I will be loyal to you”, promises Adalgisa in a declaration more sincere than anything we’ve heard from love-rat Pollione. The relationship between our two priestesses rejects competition in favour of harmony, neglects the lover in favour of the tribe. Suffering from being both male and Roman, Pollione (Peter Auty) and his pal Flavio (Adrian Dwyer) get a rougher deal. Alden’s direction brings an excellent insincerity to Auty’s gestures – notably, a proposal is delivered to Adalgisa as Pollione raises both his hand and gaze to the opposite side on the stage. While Adalgisa lies, Christ-like, on the floor, crucified by her conflicting religious and romantic desires, Pollione and Flavio stumble drunkenly across the stage. Norma brings a maturity to her considerations of love, and loyalty both to the father of her children and to the tribe, but Pollione, in response, is puerile, using the giant tree that divides the stage as a phallic symbol before holding the ties that secure the tree like the ropes of a swing – not realising that the shadows they cast bring a chilling premonition of the gallows. Though Roman, Flavio uses folksy devices – shadow puppetry, mime and low-fi props – to illustrate Pollione’s struggles in a clear reminder of who owns the power in this opera. Norma is on at the London Coliseum until 11th March. Click here for tickets.